Cairt shawin location o St. Eustatius relative tae Saba an St. Martin. 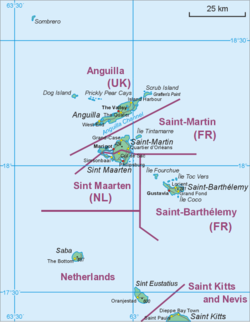 Sint Eustatius, an aa kent affectionately tae the locals as Statia, is pairt o the Caribbean Netherlands: i.e. it is a Caribbean island an a special municipality (offeecially “public bouk”) o the Netherlands. ↑ "Bevolkingsontwikkeling Caribisch Nederland; geboorte, sterfte, migratie" (in Dutch). CBS Statline, Statistics Netherlands. 2013. Retrieved 2015-03-07. ↑ The domain for the Netherlands Antilles haes remained active efter its dissolution. The ISO 3166-1 alpha-2 code BQ wis established for the entity “Bonaire, Sint Eustatius an Saba”. ( "ISO 3166-1 decoding table". International Organization for Standardization. Retrieved 2010-12-17. ) An Internet ccTLD haes houever nae been established bi the IANA, an it is unket if it will be opened for registration. ↑ "Wet openbare lichamen Bonaire, Sint Eustatius en Saba (Law on the public bodies of Bonaire, Sint Eustatius and Saba)". Dutch Govrenment (in Dutch). Retrieved 14 October 2010.